It seems my inspiration comes in runs of still life work, then landscape, then some animals. My attention on a particular subject seems unable to stay focused on one genre for more than a few weeks or so lately. Luckily I can paint more than one thing! 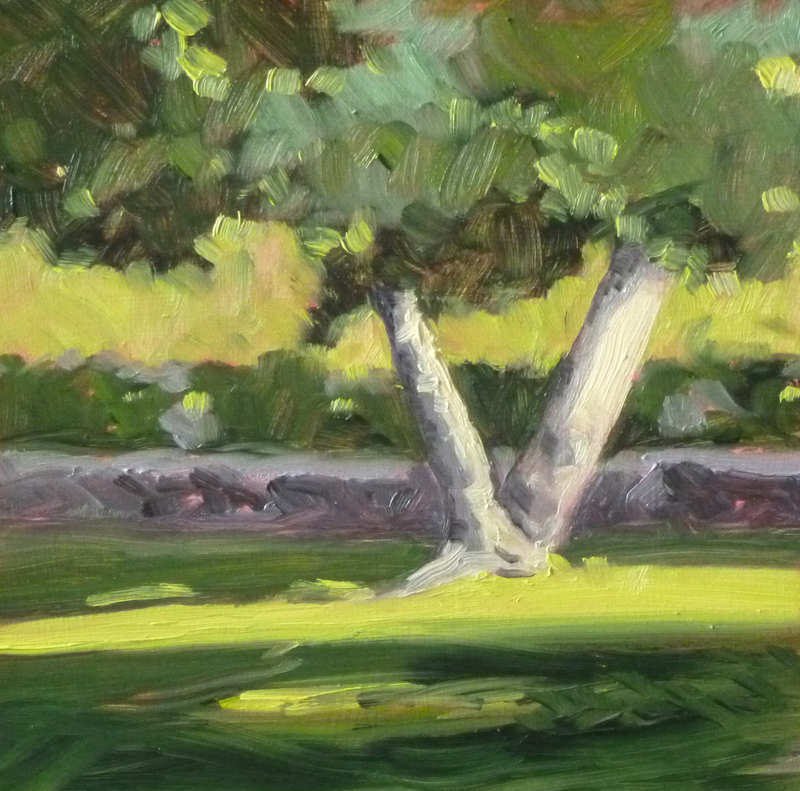 This week I have begun landscape work again. 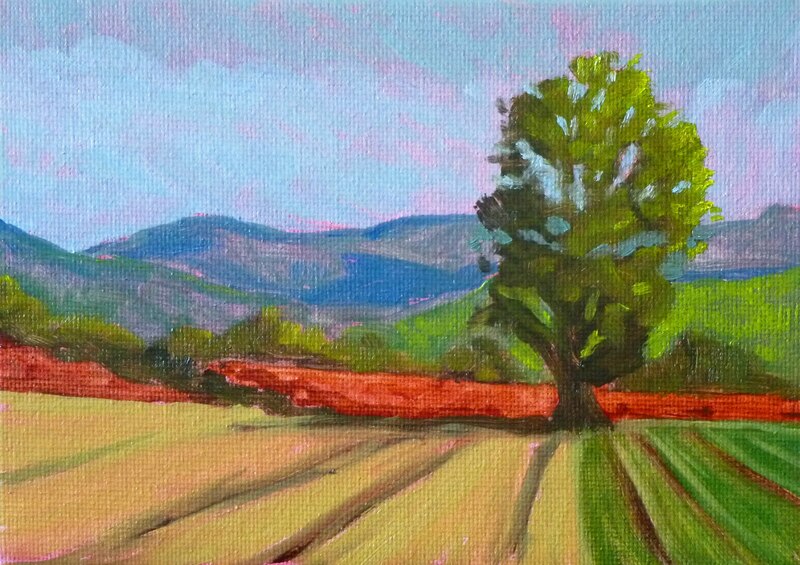 My intention this summer was to paint some larger landscapes, but I've strayed into other directions. Maybe this little sprint of small landscapes will lead to something larger. 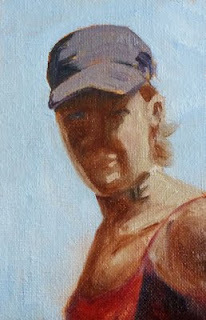 This painting is a 5x7 inch oil study that may have some potential for larger work if I can keep my attention focused. Too much summer fun seems to be getting in the way. 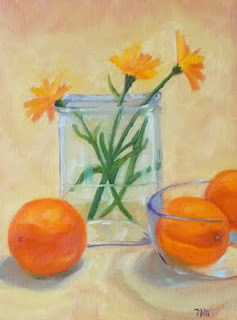 The painting can be viewed in the Small Impressions Gallery here and purchased for $40.00 plus shipping to US addresses. The flowers in my yard are prolific right now. I've had a fun day picking and painting some of the blooms. I know they will fade soon, so it has been fun to take advantage of the season. This bloom was picked from one of my Hosta plants. The large colorful leaves are what most people enjoy about these delightful plants, but they also produce a delicate little stalk of flowers. The strange thing is, I noticed on each stalk that all the flowers face the same direction. They must be looking at the sun. 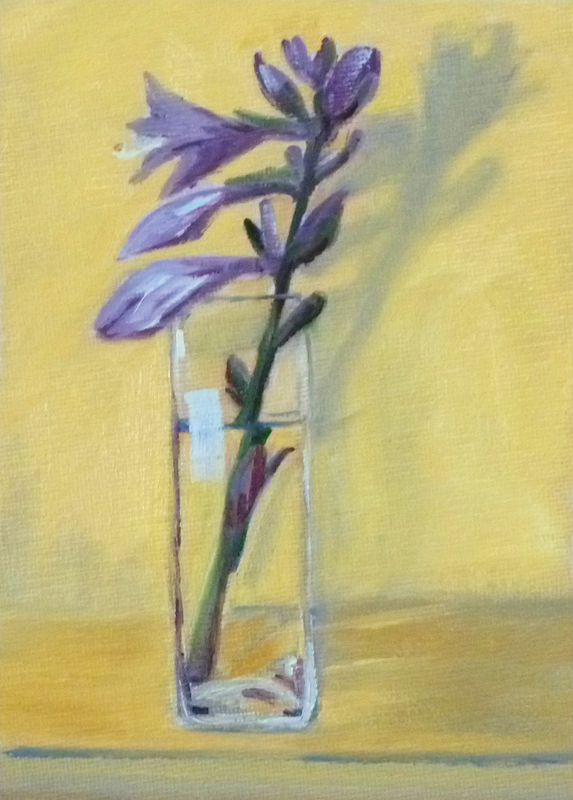 It was tempting to take some artistic license and place some of the blooms on the opposite side of the stalk, but I painted them as they were and enjoyed adding the shadow they produced on the wall behind the vase. 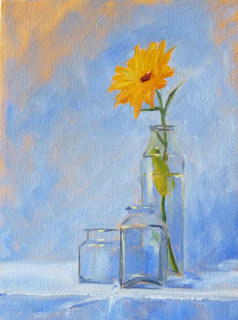 This painting and several other little floral paintings I've produced the last couple of days are for sale at my Etsy shop, Small Impressions Paintings. Visit this link to view the painting in the shop and make a purchase or click here to see all of my small floral paintings for sale. The one thing nice about Southern California was the dependability of the weather. You know it is most likely going to be sunny, unlike Washington State where it is most likely going to be cloudy or rain. I've been back for a almost a week and have only experienced one day of sunshine. The day before yesterday, I went on a bike ride and was drenched by an unexpected rain shower. Because I'm so longing for some more sunshine, I decided to create my own. This painting is 9x12 inches on a stretched canvas. When it dries, it will be listed for sale with some of my other still life oil paintings in the Small Impressions Gallery at Etsy. I just got back from a whirlwind trip to Los Angeles. Three days, four nights, and lots of activity. The first day in the city my son decided he wanted to hike up to the iconic Hollywood sign in Griffith Park. Armed with a GPS and an address, we headed out. After we parked, and without a map or the GPS, we took the first trail that headed up hill. The views of the city became more beautiful as we ascended. Four mile of uphill grade and we reached the top of the mountain, but there was no Hollywood sign in view. A friendly couple gave us a map and showed us where to go to get to the Hollywood sign. Unfortunately, we were about three mountain peaks away and on the opposite side of the park. It would have been another seven miles of up hill hiking and it was almost 90 degrees, so we decided to chalk it up to a good time and head back down the mountain. 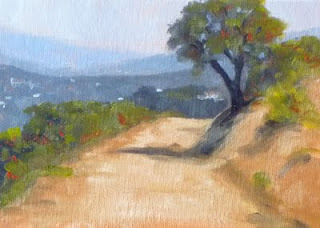 This painting is a 5x7 inch rendition of a viewpoint along the trail. As I painted, it was fun to relive the adventure. 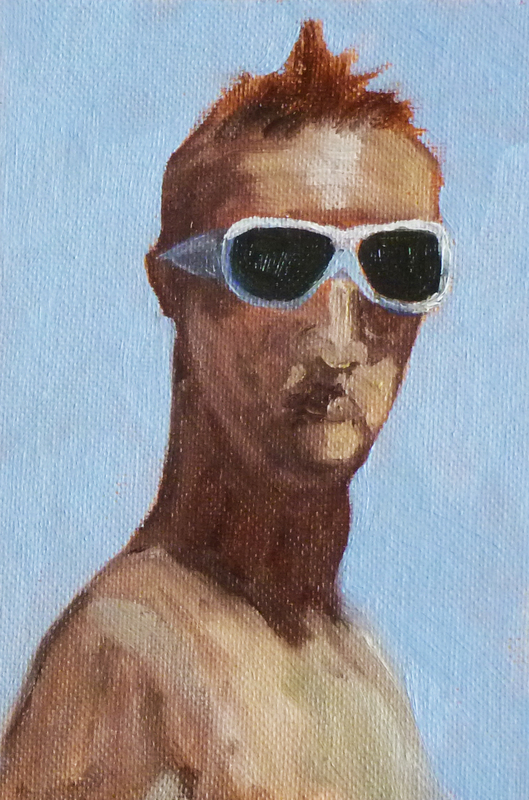 This is another in this series that has been jumping off my brush the past few days. 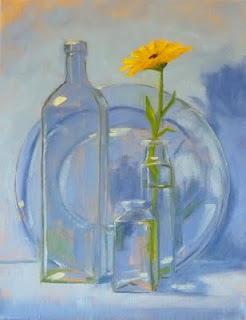 I've enjoyed rendering the glass, but have fought with that yellow daisy every time. The glass is easy. It is mostly the background color with highlights. 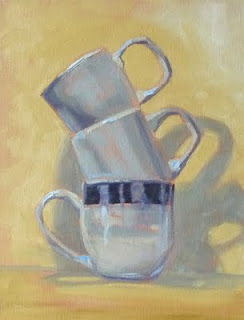 I paint shapes and it turns out looking like glass. But the daisy, she keeps talking back. It is hard to give the impression of a many petaled flower without painting each spoiled little petal. This one is the best of the lot and can be purchased at my Etsy Shop, Small Impressions Paintings, by clicking on this link. A few weeks ago, I began to run out of the small 5x7 inch canvas panels that I usually use for my daily painting. Usually I order them in bulk and have them sent to my house rather than going to the local discount craft shop where they charge way too much for panels of poor quality. But, because it is summer and I've been traveling quite a bit, I haven't been home long enough for any kind of delivery. I didn't want a large order to sit on my front porch for a week or more until I got home. Consequently, I've been painting larger on canvases that have been sitting in my closet waiting for just the right subject. It has been a real pleasure to move to bigger canvases and I've decided that "the right subject" is the one that inspires me at the moment. The size is really not important. 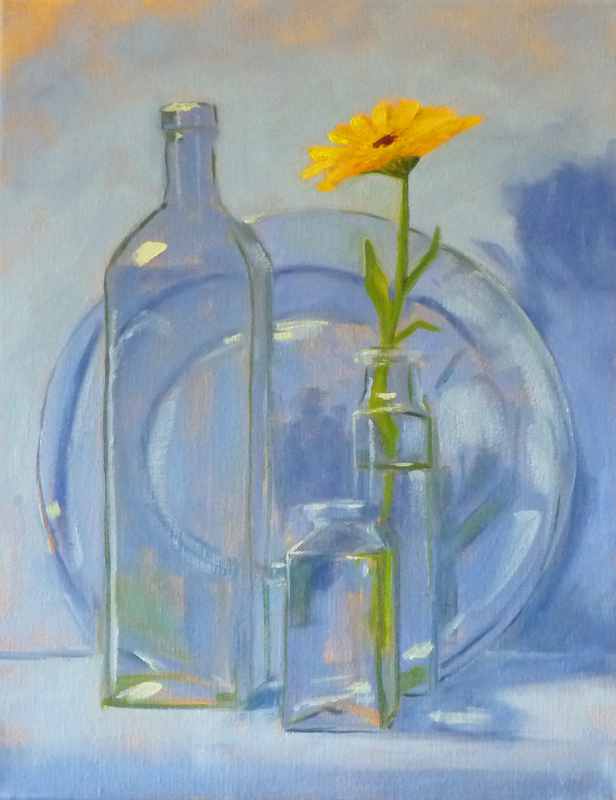 I especially enjoyed painting these little glass jars and had to place a flower in one just to add a little spice. The painting is 9x 12 inches and will be offered for sale this fall when I begin focusing on sales in my Etsy Shop again. The sun was finally out today. First thing this morning my husband and I joined our bike group for a 30 mile bicycle ride. It felt good to be out in the air for a change instead of cooped up in the house. A long ride almost always gives me energy. When I got home, I pulled my old stuffed bear off the shelf and painted him. He may look familiar. I've heard he's got a new movie out and is doing interviews, so I was pleased to be able to do his portrait. When the paint dries, I'm probably going to go back and work on the foreground a little. It is empty and boring the way it is. He was sitting on the edge of a table and I think that detail would be effective. So, he's not quite finished, but will be very soon. 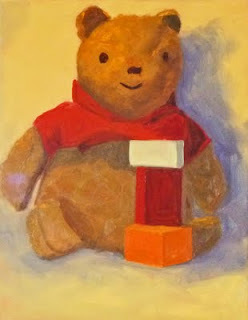 He's 11x14 inches, in oil, on stretched canvas. Inside today--it keeps raining here. I shouldn't be complaining when I hear about heat waves in the rest of the country, but it has been raining for almost a week. Yesterday I was able to take a short bike ride between showers. Just as I got home, the skies opened up. This morning a long ride was planned, but when we stepped outside, the rain started again and has been going all day. Thus, I hibernated in my studio and painted. This 11 x 14 inch painting was good practice painting white objects. It took me a long time to realize that there is very little pure white paint in the creation. Instead, lots of grays and good practice with mixing and values. Early one morning a few weeks ago, I joined my children at one of the city parks in Bend, Oregon as their dog performed his goose hazing duties. The dog is a volunteer for the parks department and is trained to chase the geese from the park so they don't create the kind of mess that Canadian Geese are prone to do. While there, I snapped a quick picture of the sunlight cascading across the grass and reflecting off a tree trunk. This tree and the early morning light were the inspiration for this 6x6 inch oil painting. It can be purchased for $50.00 plus shipping here. Although the features are obscured, my husband immediately recognized these two figures. Those who know my family personally may recognize them as well. It was exciting to capture their character even though the portraits lacked detail. I'll keep practicing this technique and see if I can figure out what the next step was in Hawthorne's process. Maybe one of these days I'll get to fully recognizable portraits. 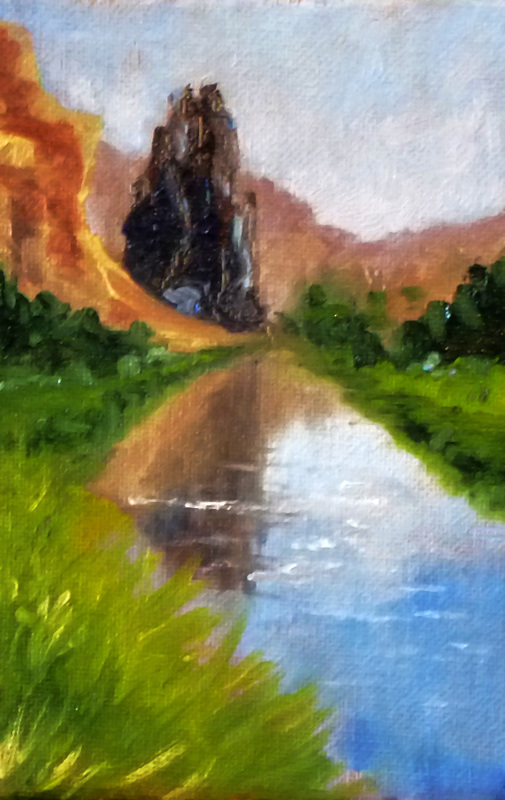 A hike along the River Trail in the Dechutes National Forest in Central Oregon inspired this 6x8 inch oil painting. 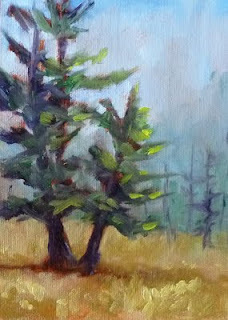 Pine trees and the early morning sunshine breaking its way into the scene helped prompt my efforts. The endless painting opportunities of this area have kept me busy for days. 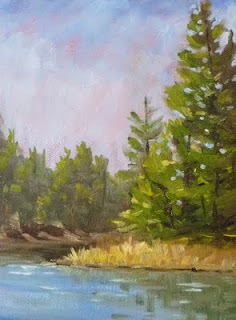 This painting can be purchased for $65.00 plus shipping at the Small Impressions Gallery at Etsy. Click here to view it in the gallery and make a purchase. Today's 4x6 inch effort is another from my trip to Central Oregon. After hiking up Misery Ridge, there is a rock protrusion called Monkey Face. It sits on top of a very tall spire of rock and looks like the face of a monkey. As we traveled down the far side of Smith Rock and transcended below Monkey Face, we viewed some of the distant Cascade mountains and this breath-taking view from the foot of Monkey Face. Sorting through some of the photos from my Central Oregon trip, I selected this view of protruding stone at the base of Smith Rock and the Crooked River. The reflection was stunning, especially after having taken a jaunt up the aptly named Misery Ridge. This painting is 4x6 inches. I was using it to audition which of the photos might be turned into a larger painting. Just got back today from a 10-day trip to Central Oregon. The colors and shapes of the landscape is so different from those of Western Washington. It was fun to venture into the wild and paint. I took hundreds of photos for future reference and can't wait to get started. 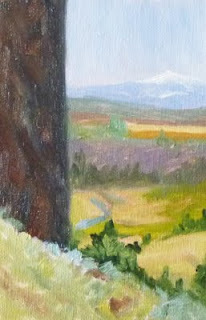 This 5x7 inch painting was painted on location in the Dechutes National Forest. Then, a few days ago we hiked at Smith Rock and I took well over a hundred photos in just a few miles. My next efforts will probably focus on some of those photos.